On Tuesday, I woke up early in the morning to serve at the Funeral Mass of Father Ernie Hyndman. The sun was just finishing its rising when I was heading out. Made for a serene start to the day. The first half of the drive was very beautiful as I rolled through small towns and farm land. Here was a little Country Store I passed by on the way. Father Ernie grew up in Mobile graduating high school from McGill-Toolen and college from Spring Hill College with a degree in English. Father Ernie is remembered for having a great sense of humor, being a die-hard LSU fan, and being a friend and Father to everyone in his midst. Strangely and sadly, last week, Father Ernie took his own life. A wave of grief swept through lower Alabama. How? Why? Can this be true? In the past week, many have wrestled to understand how such a young and lighthearted Priest could take his own life. It is impossible to understand–the darkness one is facing when they come to that decision in life. Only now, do many realize that Fr. Ernie had been battling depression for several years. It is not for us to judge. God alone sees into the heart. He alone can judge. His mercy alone can heal. It was this kind of spirit that drew everyone together in Mobile. The response of love and prayer for Fr. Ernie and his family was overwhelming. The Cathedral was packed. People were standing all along the back. Over 30 priests attended. Around 15 of us seminarians were able to be present as well. It was a sobering experience. In the face of such a mysterious darkness, I found a newfound thankfulness for being part of the Christian body. To not have to face such darkness alone, felt so powerful. To be able to come together and kneel before the mystery of life and cry out to a God who is Beauty, Love, Goodness, and Truth and trust him with all that exceeds, boggles, and transcends the mind and heart. To be able to pray for Father Enrie with his family, with all the angels, the saints, with all his friends, and all gathered there that day…was a beautiful thing. To shower him with our prayers…to place him in the hands of a Merciful and Loving God. Faith become almost tangible in moment like that. It was great to be with the other seminarians as well. Here are a couple shots of us getting ready for the Mass in the Sacristy. Even in such a dark hour, it was a gift to be able to be with these, my brothers and share the experience. Even find a way to make one another laugh in the midst of it all. Fr. 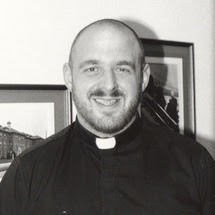 Paul Zoghby, one of Fr. 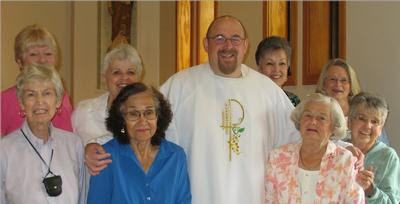 Ernie’s closest friends, gave the homily at the funeral. His words were great, challenging everyone to realize that it was not helpful to obsess over the question “What If I would have?” at this point. Rather, we gather together to remember the ways in which Fr. Ernie brought the love of Christ into our lives and to pray for him…commending him to our Good and Merciful God. He even told a Budro joke (revolving around a Cajun guy named Budro) which Father Ernie was famous for routinely telling to his congregation. Even more than his words…it was a powerful thing to see his best friend find the courage to stand before a crowd of witnesses and say Goodbye. After the Funeral Mass, we all caravanned over to the old Catholic Cemetery for the graveside ceremony. This one funeral marker made a particular impression on me. The Angel looking so confidently and steadily over the cemetery gave me a certain sense of peace and security. Too, it was great to run into some of my good friends from Seminary…who are now Mobile’s newest priests! It was my first time to see Fr. Travis and Fr. Stephen since there ordination in June. This picture above may be entitled: “Veterans of Summer Assignments in Eufaula with Fr. Snowmaker.” Each of us spent a summer under the care of Fr. David. Thanks for putting up with us over the years, for all the hilarious memories, and priestly example. Ca is one of our seminarians from North Vietnam. The guy has a great sense of humor and always sports a smile. Archbishop Rodi passed his crosier to Ca to take care of it. He is smiling because he had just figured out how to unscrew it into two pieces. Left is Matthew Stillwell, one of our newest seminarians. He will finish his Masters degree this fall and begin his seminary studies in the Spring. Right with the shades is Chris Boutin, going into his second year of seminary, reigning from Prattville, AL. With those shades, I guess Chris was hoping to catch some bass or field some grounders after the graveside service. hahaha. It was a day of mixed emotions, experiences, and prayers. All of which reminded me to be thankful for my faith…without which I would have had no hope or recourse in confronting such a situation. Here is an article that Dave O’Brien wrote about grief following Fr. Ernie’s death that some of ya’ll might find helpful. Let’s continue to Pray for Father Ernie Hyndman and all those grieving his loss.